✅✅✅ SUPER SPECIAL BUY 5 AND GET 25% OFF✅✅ ✅ Pooping. Everybody does it. Some do it better. Especially when it's powered by these delicious breakfast buds that are packed with super high fiber. Double as in not one, but two kinds of fibers: insoluble fiber that bulks up and moves things along, and soluble fiber that absorbs liquids for a soft, smooth ride to the finish. Together, they form the digestive duo that makes your pooping performance podium worthy. Each serving of Poop Like A Champion contains 16g of fiber (10g insoluble + 6g soluble) and only 120 calories. You won't be able to find a cereal out there high more soluble fiber than us. 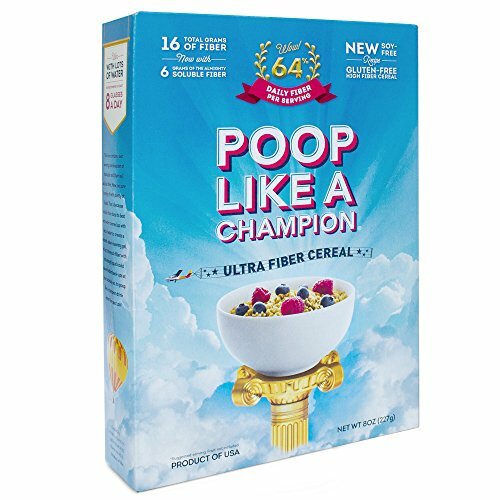 Poop Like A Champion is also gluten-free so anyone can enjoy our awesome fiber goodness. 100% Soy Free & 100% Gluten Free. ✅ POOP LIKE A CHAMPION isn't made to taste great, it's MADE to WORK GREAT! That's what makes it the most complete fiber formula money can buy. But if you like, crank up the flavor with a little brown sugar, syrup or honey for a sweet, deep and nutty taste. ✅ YOUR LIFE IS ABOUT TO CHANGE FROM THE BOTTOM UP. We've perfected high fiber nutrition with an unbeatable 100% of your daily fiber needs in 1.5 servings. Is it the best? Yes. And at $1.50 per serving it's a lot less than you'd spend on a latte at your local Starbucks. ✅ HELPS REDUCE BLOATING. Get that flat tummy, aid your digestion and get rid of toxins to help relieve excessive bloating. ✅ ONLY 120 CALORIES PER SERVING. You can stop worrying about too many carbs in your breakfast. Poop Like a Champion is 100% gluten free, low in carbs and only has 120 calories per serving. If you have any questions about this product by Poop Like A Champion, contact us by completing and submitting the form below. If you are looking for a specif part number, please include it with your message.